Continuing a commitment to presenting experiences drawn from lives lived outside the lines, Beacon Press presents The Beacon Best of 1999, a dazzling collection that includes the work of Dorothy Allison, Junot Diaz, Rita Dove, Louise Erdrich, Martin Espada, Ruth Prawer Jhabvala, Ha Jin, Jamaica Kincaid, Barbara Kingsolver, Yusef Komunyakaa, Hanif Kureishi, Marjorie Sandor, and John Edgar Wideman, as well as rising stars like Toure and Reetika Vazirani. Acclaimed playwright, poet, and novelist Ntozake Shange has chosen a treasury of poetry, short fiction, and creative nonfiction published over the past year. In The Beacon Best of 1999, women and men writing with fine grace ask us to look at the whole picture, from the street to the second story-to see, perhaps for the first time, the life of boxer Jack Johnson, or the fierceness of a love transformed into rage for a child killed by gang violence, or the complexities of a love affair in New Delhi, as lenses through which to consider questions of courage, brotherhood, and beauty. 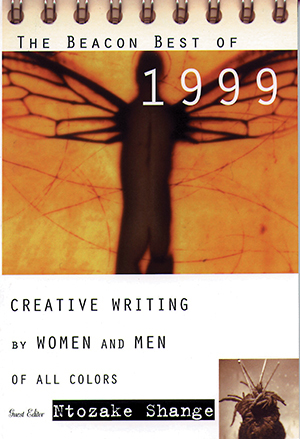 The alternative literary annual, The Beacon Best of 1999,/i> will introduce you to a world where tradition and convention are overturned and the unexpected is a welcome guest.